Over done! I am soooo over “done”! Last Sunday afternoon that word turned me into a crazy mama, racing to get groceries, finish meal prep, get kids ready for school, work on the laundry, walk the dogs andand get some down time in, it was the weekend after all! The phrase “I need to get ‘it’ done” repeatedly came out of my mouth to my family, as I raced through the day. Done is an expectation that we place on ourselves about a task or project that needs to be finished. Done can be – and this is why I dislike it the most – a finish line you may never get to. Done keeps us focused on what WE need to do. What WE have to accomplish. What WE want to achieve. Done makes us cranky, miserable and stressed out. Why do we get so relieved when we finally get something DONE? Because we worked hard trying to achieve “done”, and we are finally able to relax. Now I am not saying we should give up on our to-do’s, tasks, taking care of business. What I am suggesting is we look at the heart of our “getting done-ness”. Where is God in all of this “getting done”? And what happens when we look at done as being productive for God, instead of just trying to get one more thing checked off our list? God keeps us focused on what HE needs us to do. What HE has to accomplish. What HE wants to get. God gives us peace, security, freedom. We are overwhelmed (in a good way) with relief, happiness, and blessing when we let go of our control and let God direct our path in how much we accomplish. Now we are no longer trying to control everything. We are leaving what needs to get done to Him. Yes, you still have to put the work and effort into accomplishing a task. But the stress of what does and doesn’t get done is not up to you. 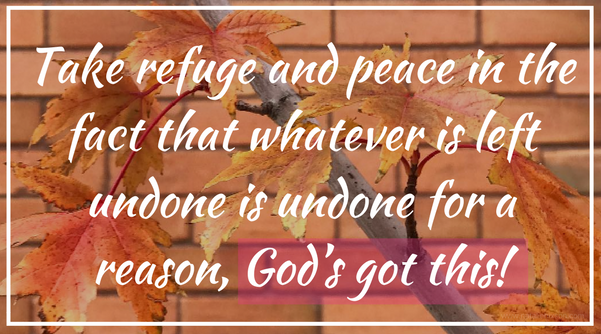 You’ve put what will be into God’s hands and you can have complete peace in what happens as the result of not getting to “done”. …when I allow God to take over my task list and give myself over to him I am much more kind when I get interrupted. No not perfect but better for sure. Do you live in the have-to-get-it-all-done mindset? Would you like to have peace over what is left undone? Here are two ways that will get you over done and give God control. 1. Spending time with God first thing in the morning can help you stay out of the “have-to-get-it-all-done mindset. God is able to set the tone, work in your heart and set you up for success – even if you fail to accomplish an important task that day. 2. Re-work your to-do list. Honestly, I don’t have a to-do list anymore. I have a business task list of what I am working on and future things to work on. I tossed my daily to-dos a long time ago, they were bogging me down and actually stopped me from doing anything productive. I have an entire guide on how to Toss Your To Do List and Get More Done (don’t let the title trick you, done is a key word there). Click Here To Start Your To Do List Detox! God offers us freedom in Him. He has called us to do things for His Glory. When we allow God to lead us we find peace and growth. The best part is we are able to accomplish more for His glory and not for our own satisfaction. We are allowing God to transform us and we are strengthened in him! Who are you serving…your tasks and to-dos, or the Lord? What is your reason behind what you are trying to “get done”? Are you working for your glory or Gods glory? Pray for good fruit, he will lead you to strengthen yourself in Him and work through frustration. I have have struggled with anger issues. Being interrupted in the middle of a “get it done” session is one of my stronger anger triggers. These Bible verses and spending regular time with God has helped me to work through this, I haven’t perfected it but have gotten better with the Holy Spirit’s help. Mama, I know you have a lot to get done today. So work on it, but first, ask God to use you as His tool to accomplish what He wants today. 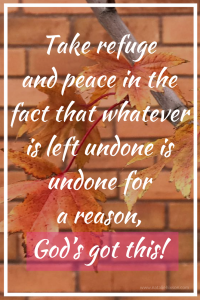 Take refuge and peace in the fact that whatever is left undone is undone for a reason, God’s got this! When you hand over your to-dos to God you are no longer responsible for what doesn’t get done. He is! If you are working and you become stressed then it may be time to take a break, take a deep breath, pray and lean into God. Allow him to take control. How does it feel to know that what is left undone is in God’s hands? Did you just catch yourself taking a huge deep breath? You’ll find peace when the responsibly has been transferred from you to Him. Hallelujah, God is so so good!